A refrigerator is a long term investment and therefore warrants thorough research and a good think about what would suit your household’s needs. And there’s plenty to get excited about these days, with a raft of features to make life easier and even that little bit more glamorous! From built-in ice makers, to keeping your food fresh for longer, to that all-important style, refrigerators offer a lot but try not get sidetracked by a bombardment of fabulous features – you need to figure out what is right for you and your family. Firstly, you need to assess how much storage space you need. This might be slightly governed by the space in which you have to fit your refrigerator but trying to cram too much into your fridge will affect its efficiency. Ideally, the main concern should be the number of members in your household, bearing in mind the likelihood or not that the family will increase in the next few years, and the amount of food you need to refrigerate. Conversely, buying a refrigerator that is bigger than you need will also waste energy (and money) as you will be cooling down a space that isn’t being used. This doesn’t just refer to the way the refrigerator looks (although there are a wide range of options in the current market, including bright colours, an array of patterns and different finishes) but to its orientation. 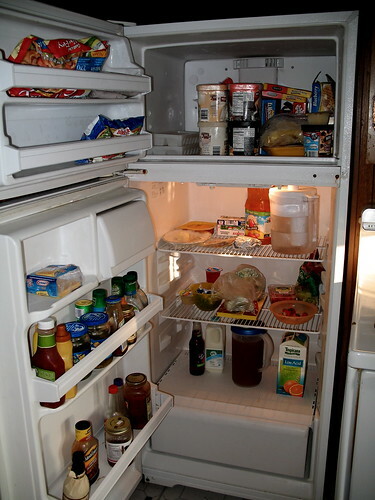 There are two basic types of refrigerator – freestanding and built-in. Built-in refrigerators are integrated into a unit and camouflaged behind a door. They can give a kitchen a ‘cleaner’ look but don’t give you much choice; in fact, you may have no choice whatsoever if it is part of a fitted kitchen. Plus, they tend to be more costly to run due to having to work with less air flow. Choose a freestanding refrigerator and a range of options are open to you. Do you want a side-by-side fridge-freezer, a refrigerator with freezer on bottom, or one with the freezer on the top? There are a number of fantastic details which can make life easier and allow you to tailor your fridge-freezer to the needs of your household. If you use a lot of ice or live in a hot climate it makes sense to opt for a built-in ice maker, which dispenses ice cubes, crushed ice and ice-cold water. If you buy fruit and vegetables in bulk and store them for days at a time, the humidity control fruit and veg bins offered by all Fisher & Paykel fridges will be a great help – condensation from the respiring produce is captured and retained by the humidity control lid, preventing the moisture from dripping back down onto the produce and causing it to rot. If you entertain a lot you may want to opt for removable wine racks, a holder for bulky Champagne bottles, or can racks which store cans apart from the main shelves. Choosing the right fridge-freezer for your family’s needs isn’t easy but our guide should help you to decide between the many options available to you.